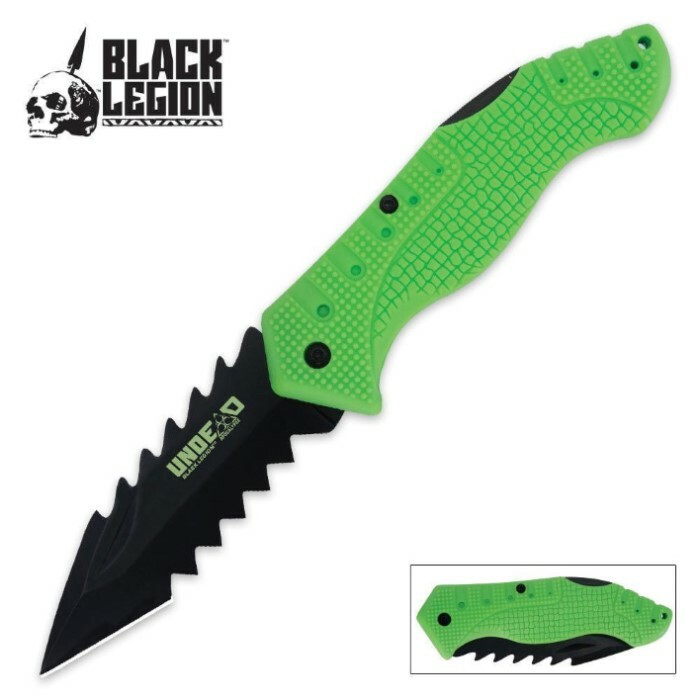 This bright green and black lock back pocket knife sports a rubberized grip, stainless steel blade, spear point tip, and aggressive spikes. Includes pocket clip on back (not shown) and measures 4 1/2 in. closed. This knife is so vicious looking. It's amazing. Just so cool. I'm in love with budk!! As soon as you pick it up you can feel how light and flimsy it feels. There's no metal liner or frame underneath the green plastic so I feel like it can break easily. The metal lock holds the blade but it moves around a little bit both when locked and unlocked. The blade itself wasn't sharp and the serration does nothing but get in the way of any kind of cutting or slicing motion you make. I got two of these during the buy one get one sale they were having and both the knives had the same issues so it's fair to say these knives are not well built. That said I wasn't expecting them to be and if you're one of those people who love collecting zombie themed stuff then I guess you could pick this up considering the low price. For the price, a very well built knife. The unique look of the blade as well as the scales really stand out. My Grandson and his girl friend are both big fans of the Zombie T.V show, so I bought two of these knives as gifts. Kind of a His and Hers theme. They are both enjoying the knives, so it looks like a winner. Thanks, BudK. I brought the knife for its unique look and was very pleased. It is a good conversation piece and nicely built. For the money you can not go wrong. The plastic handle may feel like cheep plastic, but is still nicely built, and the blade itself is INSANELY SHARP!!!! I also like the Undead Logo on the blade as well.